Rosetta is an ESA (European Space Agency) spacecraft, launched towards a comet in March 2, 2004. To be able to catch up with the comet, Rosetta has to take a long route through the planetary system, including three flybys of Earth and one of Mars, before arriving at comet Churyomov-Gerasimenko in 2014. At the Swedish Institute of Space Physics in Uppsala, we have built an instrument called LAP (Langmuir probe) to study the ionized gas (plasma) close to the comet. However, this instrument and its companion instruments in the Rosetta Plasma Consortium, RPC, can be used also for exploring space around Mars and Earth during the flybys. 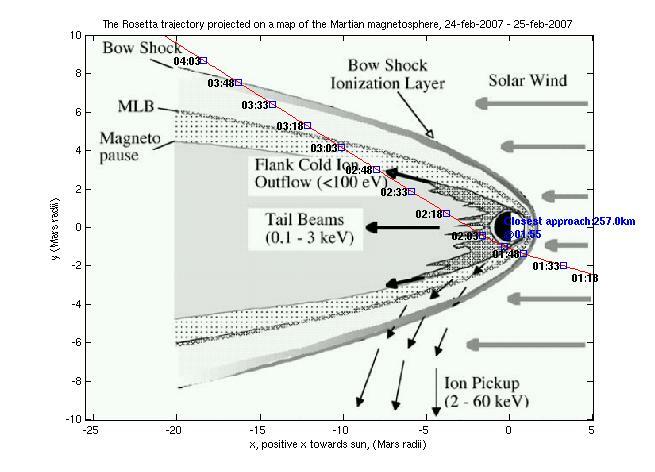 The Mars flyby on 25 February 2007 is highly interesting, as very few spacecraft with reasonable plasma instrumentation have ever visited Mars. As an example, none of the spacecraft now at Mars have anything to match the RPC instrumentation. In order to get the most out of the Mars flyby, careful planning is needed, including modelling of the environment. This was the topic of the present work. Study existing data and models for the Mars environment. Combine with existing orbital information to model what LAP and the other plasma instruments may expect to measure during the Mars flyby.